MJ left some comments on my Picasa photo albums (see right for link). I replied there but wanted to add some information about this sampler she liked. 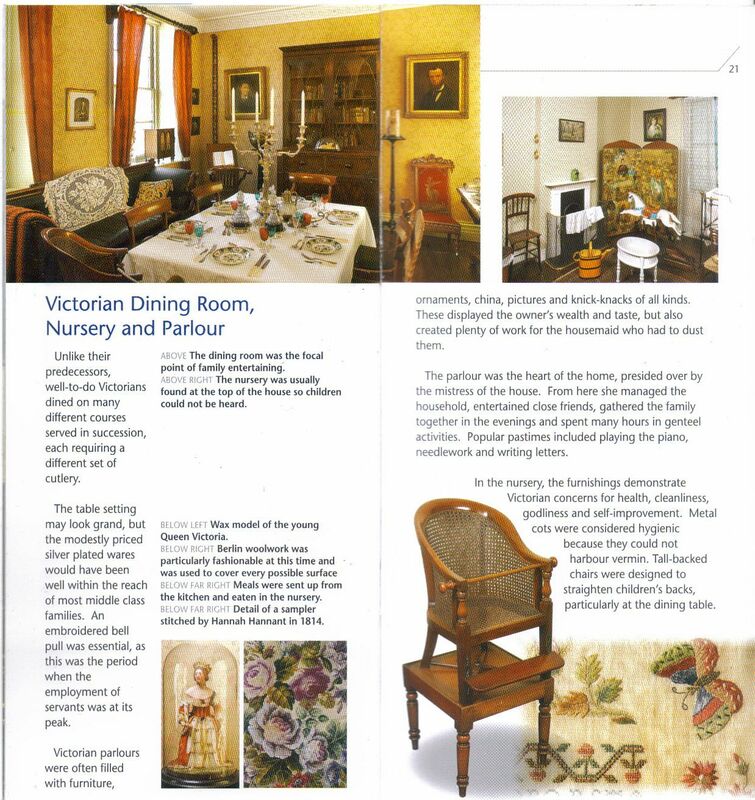 The design came from magazine called "Needlework" from Future Publishing. It was in the October 1998 issue and I must have really liked it as I stitched it straightaway as you can see from the date! JMM were my initials then. 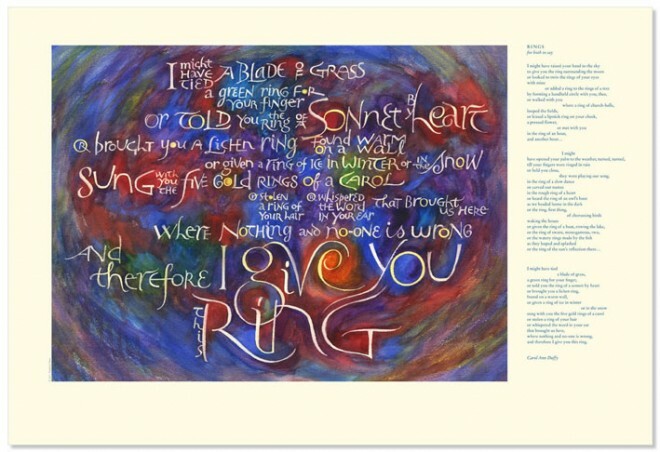 It was designed by a reader called Sally Hesketh who was a big fan of Tudor and Elizabethan history. 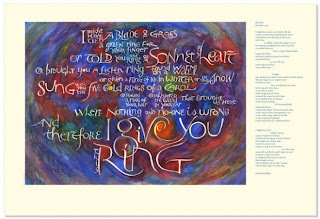 This was her first attempt at designing a C17th inspired piece. 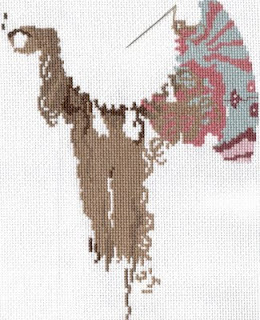 I have googled her and found a Band Sampler in the current issue of Just Cross Stitch by a designer of the same name. Maybe MJ has seen her work before which is why it looked familiar. 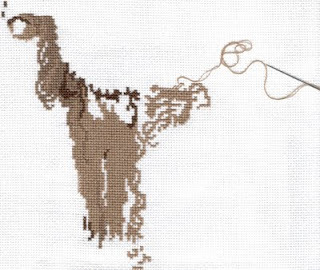 The article says she visits the Fitzwilliam Museum and Montacute House in Somerset for inspiration so maybe this piece was based on a more famous sampler? Mouse asked about the LNS which is closing :-( It is the Work Box in Timber Hill, the ironical thing is - they just won an award in WOCS for best regional shop in East Anglia! Gillie - glad to hear you know "my" city too. I worked there for 17 years and loved it, sometimes I wish I'd bought a house there instead of my hometown. But I'm close to my parents which is good for me and the boys. 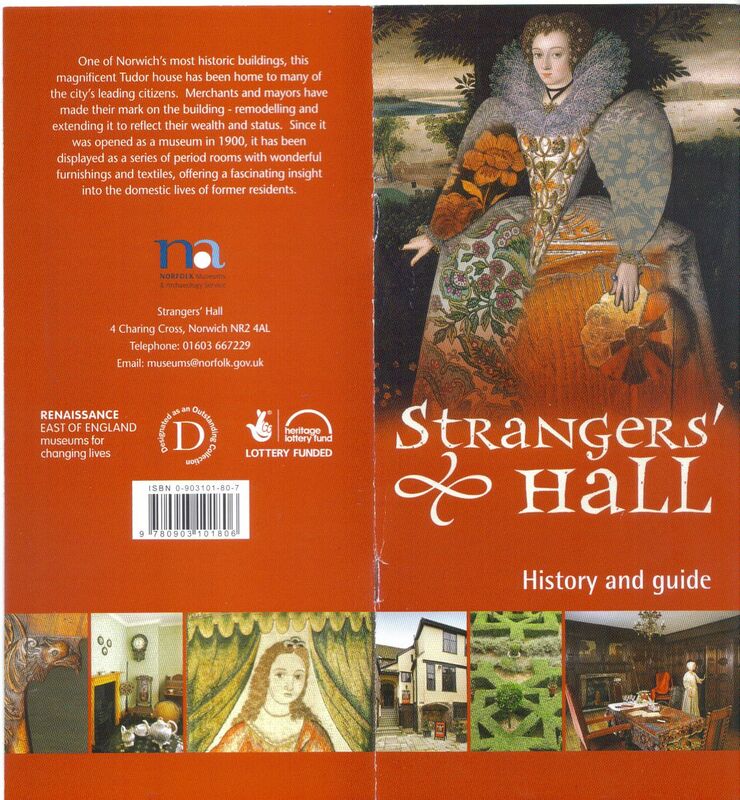 Glad you all liked hearing about Strangers' Hall. It's great to revisit places from your childhood with your own children. It's one of the things I enjoy about being a Mum, sharing books and places with my son. It isn't finished because I have sent it off to a friend so she can stuff it herself (easier to post flat!). The stitching was nice and easy but I do NOT enjoy sewing these things together. Especially the felt. I find it very hard to keep my stitches nice and even. Once again thanks for your comments and followings. I'm trying to return the following favours so if I'm not already doing it then please put a link to your blog and I'll track you down! I had a most enjoyable day yesterday. The large boy and I went "up the city" as we say round here. My lovely LNS is closing soon and was having a big 40% off everything sale. I made a list of the DMC I need for my next couple of projects and sent him to the stand to find which ones they had left (who said children aren't useful?) while I browsed the charts/fabric etc. I tried to control myself but still ended up with more than I intended. I'd not seen the Lesa Steele dragons before and they are lovely. Samplers combined with dragons - what a combination! I got three more of the Just Nan small squares, now I only have one more to collect and I have them all. Plus a larger Just Nan. The rest is mainly fabric, enough blue evenweave to stitch both dragon samplers and plenty of white/cream for whatever. The mint green is pearlescent and so pretty, just right for Christmassy things. Plus some beads, some Kreinik. And a snowflake for no good reason. RIP Timberhill Workbox - you will be missed. Oh yes, and I bought the latest Cross Stitch Collection mag for the Joan Elliot Flower Fairy. After a delicious and nutritious meal in MacDs we went to a museum - Strangers' Hall. This is a beautiful historic house in the centre of the city which dates back to the 14th Century. It's been a museum since 1900 but was closed for a while at the end of the 20th Century. Happily it has reopened now and I was able to relive my childhood visits with my own son. The house is a maze of small rooms and staircases leading you round the entire house. Each room is decorated for a different period in history from the Tudor Great Hall to the Victorian Nursery via the C17th Walnut Room and Georgian Dining Room. Some of the textiles are original and some are reproductions. One of the guides told me there is a sewing group who make them for the house (I must find out how to join in!). 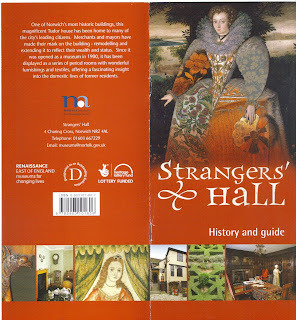 the Hall is called "Strangers' Hall" after Dutch, Walloon and Flemish refugee weavers who stayed there in the C16th. They helped revive the ailing textile industry. there is a painting showing 10 decades of a man's life with each decade represented by a different animal, lamb for a baby, kid for a 10 year old, lion for a soldier, fox for a wise man right through to a swan for the old man (his swan-song). there is a wonderful toy room full of old toys including a Noah's Ark with every animal imaginable in a long line, 2 by 2. This is displayed in EXACTLY the same way I remember it from my childhood although the toy room has been moved to the ground floor now. I didn't have my camera but here are a couple of pages from the guide. The bottom right picture is a detail from a sampler they have there by Hannah Hannant dated 1814. Unfortunately I haven't been able to find anything about her at all! Final picture - this was my week for joining in with the Mirabilia Board Mermaid SAL. I say my week but it was actually 10 days as I never want to put her down! The top picture is more true to colour. They were both taken in daylight but the closeup was taken by the window which seems to make the fabric very turquoise blue. This time I finished stitching the top plume, the conch shell and the tail fin. The gaps are for metallics and beads which I leave until last. 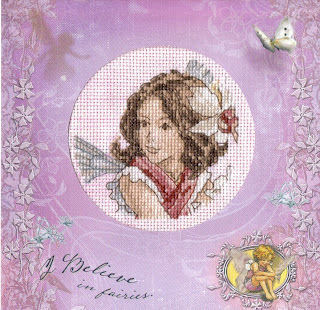 She is stitched on a 32 count Murano from The Crafty Kitten called Waterfall. Tonight I promise faithfully to start my Art Nouveau Brunette Head which will be Number 4 on my 11 in '11 but keeps getting shunted in favour of more pushy projects which shout "STITCH ME NOOOOOOOOOW" more loudly. Or is it just the voices in my head?!! I have followers!! and comments!! Thanks for both, ladies. Dani - it took me a while to set up the blog how I wanted it to look. It's all new to me and there was alot of trial and error involved. The backdrop I found by accident, it's one of the standard ones but I really liked it so will keep it for a while. I wanted to add lots of photos so there was plenty to see. After a week I thought I'd better get round to posting something! This has been a good weekend socially and stitching wise. I finished my railway carriage (see below), started a cover kit and have done a good part of Bluebeard's Mermaid. My week is up tomorrow but I want to finish more of her tail fin so will keep going until Wed or Thur. I have decided that SAL weeks are decimal, they are actually 10 days long not 7. This is my railway carriage - it is stitched on a piece of 14 count aida attached to a piece of upholstery fabric. Earlier this year a man came into the hall where my Toddler Group meet with a load of sampler books from an interior designers. They were free to a good home. The cushion lady, the scrapbookers and I fell on them with delight! We shared them out and I got all the smaller ones. There are some beautiful pieces of very expensive material there (£75 a metre!). My heart in my avatar is stitched on one. I chose this red piece for the railway carriage as it was too dark and patterned to do much else with. When I turned it over the name label said "Railroad effect". Now that is what I call serendipitious :-) These sorts of things happen all the time with my stitching, hence the name of this blog. The design and words are all my own work, the threads are from my scraps bag, the railway line is a long piece of black threaded under the stitches in the sleepers. It's a really nice effect and very quick to do. On a brighter note I spent this afternoon at a baby shower for a good friend. We played games like Taste the Baby Food (they all taste of yuck) and Sniff the Nappy. Not as gross as it sounds or looked. The hostess had melted some chocolate bars onto nappies and we had to guess which ones they were! Charming! I took some booties along as I didn't want to go empty-handed but her present will be this cute cross stitch Nimue - The Baby Swing. I ordered it from Violarium though I have since found you can go direct to Nimue on her French website. Anyway Violarium sent me half a dozen free charts with my order which was lovely so I was pleased with that. I just have to find the perfect fabric now, Dawn from Crafty Kitten is helping with that. My friend doesn't know what "flavour" baby she's having (she has one of each already) so this is perfect as it's unisex. Once again, thanks for all your comments, happy stitching! Having set up my blog I then spent ages adding all the photos onto a photo-hosting site so people would have something nice to look at when they get here. I've been thinking alot about what I like in a blog, whose blogs do I enjoy reading and which do I just skim the photos? I've realised the top priority is photos - works in progress, completed works, cute cats sitting on WIPS etc. Then I like the more "interactive" blogs where people are asked to share their thoughts and opinions on a subject. Links to fun projects are good, links to anything interesting, links which mean I can find pictures without having to google stuff and get lost looking at irrelevant but interesting sites. So, the top priority first - here are some pictures. The first two are my current WIPS, Mirabilia's Bluebeard's Mermaid for a SAL on the Mirabilia Board (see right for link) and The Dark Alphabet being produced one letter at a time by A Note of Friendship blog in memory of Lisa Roswell. Actually I've done more than that but it's the most recent photo I have. I am due to finish this month's session on Monday and will post her again. This is great fun! I'm stitching it on a piece of tea-dyed 28 count evenweave. The border I've stitched over 2 because it's soooooooooooooooooooooooooo boring otherwise. It's quite exciting not knowing what's coming next! C is for Coven which I've started but is on hold while I work on a "protest piece". 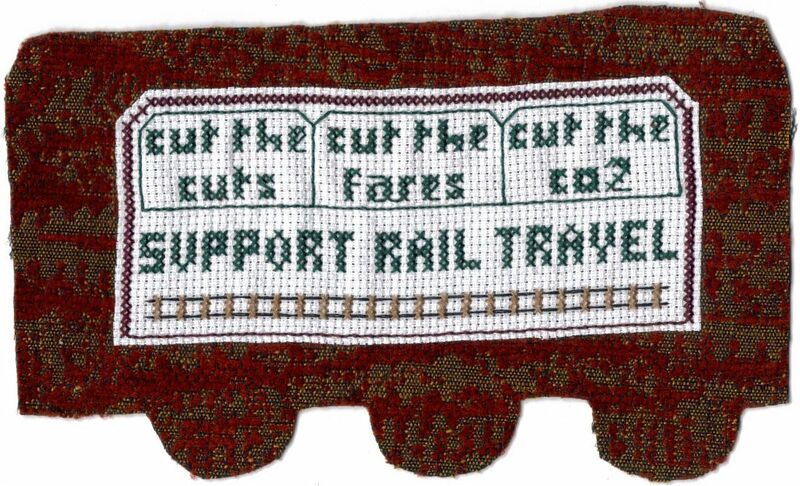 The "protest piece" is for this group The Craftivist Collective who have organised A Railway Adventure. They are holding "stitch-ins" in various railway stations across the country with pic-nic lunches, blankets and craft. A nice civilised way to protest the extortionate fare increases﻿ planned. 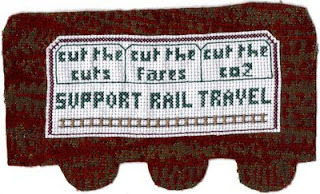 Unfortunately I can't get to one but I'm stitching a railway carriage to send for their bunting! I'll post a pic when it's done. Well, that's it for my first post. I'm off to stitch some of Blue's tail. If anyone's reading this - please leave a comment. Let me know how you found me and a link to your blog (if I don't already follow you). I only realised how many people I stalk follow when I added the list to the side of this blog!